Here’s what I ate for dinner a few weeks ago: about a quarter pound of meatloaf, a heaping helping of buttered noodles, some salad. Then, for dessert I had a huge bowl of popcorn, half a chocolate bar, a very large piece of cheese, an apple, and two scoops of peanut butter. And I found myself searching around the kitchen for something else to eat. 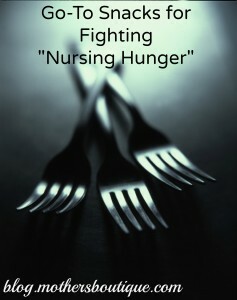 I have Nursing Hunger. If you’ve ever nursed a baby, you know the hunger I describe. Like there is no bottom to my stomach and there aren’t enough things to put in my body. Ravenous. All the time. Plus, I’m tandem nursing, so the nursing hunger is even crazier. I know that tandem nursing means I should add about 700 calories per day to my diet. To some folks, that sounds insane. So much food! But 700 calories adds up very quickly and I just don’t feel like it’s taking the edge off. I also know that I’m supposed to focus on healthy fats and protein while I’m in this life phase. Heck, I can’t even remember to drink water most of the time. How am I supposed to focus on eating well to calm the savage nursing hunger beast who lives inside my stomach? When I can manage it, I snag some time on the weekend to make protein bites (basically unbaked peanut butter cookies) and pre-slice some veggies and cheese. I can’t often manage it, so I’ve been doing my best to buy pre-packaged snacks that stick to my ribs a little better. Rolled up slices of deli meat. Bring on the deli meat! A lot of days, I just wind up snacking on the goldfish crackers I’m doling out to my boys. Each day is a new chance to make better choices, though, right? What are your go-to snacks for nursing hunger? Leave us a comment to share your tips! I tend to snack on yogurts – baby bell cheeses & boiled eggs … I boil up 4 eggs every morning and snack on them throughout the day…. I do eat more biscuits than I should too – oops ! When ur hungry & Youv a clingy baby you do what you have to to survive hey ! Good tips! Smoothies are great if you prep them in bags ahead, I also make microwave whole wheat quesadillas. A big bowl of salad is always easy with rotisserie chicken from costco!